For most parents, an independent education is aspirational and the decision about whether to pay school fees of between £10,000 and £35,000 per year comes down to one simple fact – how much money is available. However, with bursaries and scholarships the decision might not be quite so black and white. It then becomes helpful to consider the key components of each system against the investment they require. This article considers the five main areas. If you are struggling to determine whether to send your child to a state or independent school, our education consultants offer independent advice to help you select the best school for your child and family’s requirements. It is important to know how good the particular independent or state school is. Not all independent schools are academic powerhouses and many state schools are academically excellent, even if they aren’t grammars. However, you might be concerned about the lack of spoken English or the social mix of children that your child will be growing up with. London in particular has polarity between good independent schools and bad state schools. In an ideal world, middle class families would send their children to the local primary, support the teachers and help ‘improve’ the school from within. But this poses challenges on many levels. If you are extremely fortunate, you might live close to a state school that shares teaching resources with an excellent independent school, such as Harris Westminster, which is heavily supported by Westminster School (from which an average of 50% of pupils go on to Oxford or Cambridge). The decision then becomes much easier. The Tatler Guide to State Schools offers some excellent but limited suggestions to other good state schools and you can also compare schools by league table results. All schools market themselves on having high expectations for their students. But in theory, in independent schools, parents have the power to push harder, teachers can be given more flexibility and may, arguably be better because the pay and working conditions are preferable. League tables would suggest this is true. However, they often fail to look at something called, ‘Value Add’. We know for a fact that children in many independent prep and senior schools have extensive tutoring from teachers and professional private tutors. Children in state schools don’t. So which schools are actually better? If you get your child into “X” independent school you might feel a warm satisfied glow but will your child succeed without additional investment in private tutors? The flip side of this argument is that in a good independent school peer-to-peer learning will probably be enhanced because they are in a class with lots of brighter children, from whom they will learn. The average level of attainment will be higher, and it is this level that really counts for most parents (whose children are, as much as they hate to admit it, academically average). Heads of independent schools often suggest that a major problem for state schools is government regulation, in the form of the National Curriculum. They would say that there is little room for passionate teachers to deviate from the main curriculum. I am not sure how much this matters in practice: a good teacher will inspire regardless of the curriculum they have to wade through. The importance placed on Continuing Professional Development in state schools means that teachers will be trained and continue to learn at an accelerated pace. The main problem is that preparation for national tests drain precious teaching time; when children leave state school they might be very good at passing tests but they might not have been as well grounded or inspired academically as their independent counterparts. Independent schools sell themselves partly on the wide range of extra curricular activities. Why are these important ? Because they give children who aren’t good at mainstream subjects like English or maths a chance to shine, and therefore to gain confidence. The more options there are, the more likely they will find something they excel at. School fees are not necessarily a deal breaker because financial help is usually available. Nearly all schools offer bursaries (means tested) and scholarships (ability tested). Christopher Middleton in The Telegraph reports that private schools belonging to the Independent Schools Council provide £780 million of free education which benefits just under 35% of pupils. 1% get a 100% fee reduction. The problem is that even if your child can afford to be at the school, will they feel comfortable? Will they, for example, be put off by their friends going on expensive holidays? I would argue that this is probably a small price to pay for the excellent education they will receive. Financial limitations are more likely to cause problems later in life when children can’t take an apprenticeship or a free internship because they can’t afford to not work; whereas their more wealthy friends can. Additionally, you really have to ask yourself, ‘what else could I do with the money’. A report by stockbroker Killick & Co pointed out that the, “£236,000 paid by parents of a day pupil would, if invested, return nearly £800,000 over the child’s lifetime – enough to pay for university, put down a substantial deposit on a house and leave £500,000 for retirement.” If finances are being stretched to breaking point, who benefits? Does your child really want permanently stressed parents, with no holidays, no pet, no hobbies and, in short no fun? Just to serve the greater good of a future they might never be able to appreciate without the help of therapy? It is possible to choose both state and independent. Prep school is a luxury – the state primary won’t do any harm. After this, there are several stages at which you can make the move to independent. You will need to do some preparation though, to help get your children up to speed for the 7+ or 11+ or 13+. No matter how intelligent they are, they will be at a disadvantage against children who have been prepared intensively for the last several years. Regular private tuition will help bridge the gap and although not cheap, will cost no more than the equivalent of a term’s fees to get much the same result at Common Entrance as several years at a prep school. (Or you can go to Galore Park and download sample papers and handbooks and have a go yourself.) Sixth form is another good time to make the switch. The almost universal pre-requisite to getting a good job is attending a decent university. So how important is school type in terms of getting to university? 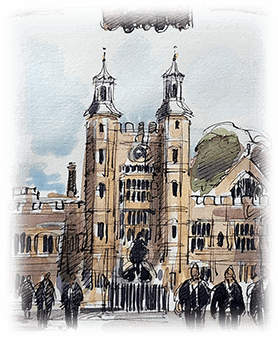 The Guardian reported that although only 7% of British children attend fee-paying schools, students from private schools make up 39% of Cambridge undergraduates (at Oxford, the figure is 43.2%). And state school admissions to Cambridge dropped by nearly two percentage points this year. At this level, it is clear that sending your child to independent school may confer advantages when it comes to Oxbridge application. However, there are many other brilliant universities, and in fact 89.3% of undergraduates admitted in 2012/13 were from the state system and 19 out of 24 members of the Russell Group recruited more students from state schools than independent ones. (Although this last statistic is skewed by the fact that there are many more children at state than independent schools). Academic results notwithstanding, the major concern of a state school education should be the acquisition of soft skills. As John McDermott believes, without good eye contact, a firm handshake and the ability to speak grammatically and hold an argument, students will simply not get jobs; no matter what their academic qualifications. There are reports on how state school confer a disadvantage in terms of confidence but anyone who did not enjoy their independent school will know that fees don’t necessarily guarantee confidence. If money truly is no object the obvious choice would seem to be to choose a good independent school, one that your child likes and will thrive at (not necessarily the one that you want to brag about at the dinner table). For many parents the choice may not be so clear. Children at state schools should be taught the realities of life beyond school. They need to be aware that academic results are not everything and soft skills, confidence and self-belief are vital in the world of work. In the words of Tony Little, ex Head Master of Eton College, ‘nothing can replicate what a parent can provide’. If you raise your child to be mild mannered, confident, pleasant and ambitious then it won’t matter particularly what school they go to. The world is becoming more transparent and meritocratic and they will be just fine. We are the trusted partner for parents at every step of their child’s academic journey. To discover how our education consultants can help you select the right school for your child, please visit our Education Consultants page.